There are both hits and misses when it comes to the dining options on Jewel of the Seas. When disappointments with meals do occur, they are fairly forgivable, thanks to the atmosphere and service in all eateries Special dietary needs, such as gluten-free and vegan, can be met in all eateries. If you don't see anything suitable on the menus, just inform your waiter. 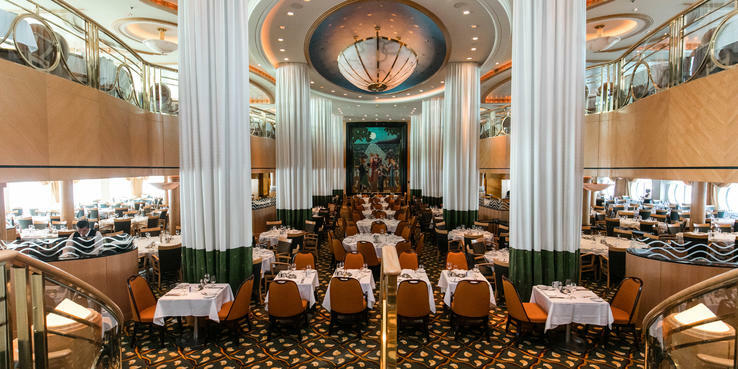 Tides (Deck 4 & 5): Jewel of the Seas' main dining room is split across two floors. Looks-wise, it's a bit The Great Gatsby. Curtains cascade from the top to the bottom floor to look like pillars, there's a waterfall feature at one end and a 1920s-style mural at the other. It's open daily for open-seating breakfast -- when made-to-order dishes like eggs Benedict are served up -- and on sea days for open-seating lunch. At dinner, Tides offers Royal Caribbean's flexible My Time Dining program. Passengers can choose between assigned early (6 p.m.) or late (8:30 p.m.) dining or opt for flexible dining, in which you pick a preferred mealtime (anytime between 6 and 9:30 p.m.). With My Time Dining, you can change your reservations on a daily basis or just show up whenever you want. You're not guaranteed to get a table right away, but you won't usually have to wait long before you are seated. Those opting for My Time Dining will need to prepay gratuities. The evening menu has a theme -- such as pimento or pomodoro -- every day. There is always a pasta, fish and meat dish on the menu and a selection of "classics" that never change, such as sliders and New York strip steak. Vegetarian options include the likes of linguini and risotto. The dessert menu features a few options that never change -- such as cheesecake and a cheese board -- alongside nightly specials like poached pears or baked Alaska. Sugar-free options are also available, although they're not that imaginative and usually amount to a bowl of sorbet. As with other ships in the line, diners onboard Jewel of the Seas can order some extra-fee entrees, including Maine lobster ($29.95), surf and turf ($34.95) and a Chops Grille filet mignon ($16.95). There's also a three-course Vitality option for waist watchers, where the calories in the dishes add up to just 800 calories. Windjammer Cafe (Deck 11): The ship's buffet venue serves breakfast from 7 to 11 a.m., lunch from 11:30 a.m. to 2:30 p.m. and dinner from 6:30 to 9:30 p.m. It closes between meals. It features a number of food stations, such as Hot & Tasty, Fresh from the Garden and Healthy and Sweet. The dishes are typical cruise fare -- think eggs, bacon, pastries and cold meats for breakfast, and pizzas, pastas and stews for lunch and dinner. The evening menu also tends to include a few regional dishes -- like gyros when you are near Greece, and on the whole it's tasty stuff; think decent pub grub. Windjammer can get a little crowded at breakfast -- expect to do a few laps before you find a seat, especially on sea days. Solarium Cafe and Pizzeria (Deck 11): This pocket-sized cafe serves rectangles of pizza and a range of sandwiches. It's open from noon to 6:30 p.m. and between 9 p.m. and 2 a.m.
Room service: You can fill out a card in your room and hang it on your doorknob to ensure that breakfast is delivered to your room in the mornings. Continental breakfasts are delivered for free, but other options -- like pancakes or scrambled eggs -- come with a convenience charge of $7.95. Other snacks and larger meals are available 24 hours a day. The menu features dishes like hot dogs and quesadillas. These orders also come with a convenience charge of $7.95. Cafe Latte-tudes (Deck 5): This coffee bar serves up specialty a la carte coffees and sweet treats, like cookies and cakes. Coffees cost around $3 or $4. Giovanni's Table (Deck 6); $29: Added during the 2016 renovation, Giovanni's Table is a specialty Italian restaurant. It's got a contemporary bachelor pad look to it with leather seating, dark wood tables, and black napkins. The food here is of the cut-above variety. A starter option is a plank of antipasti. Main meals, meanwhile, include a fist-size filet mignon with a Barolo sauce, grilled prawns with garlic butter and Italian herbs, and braised veal osso buco. Desserts are brought around on a trolley, so passengers can chose the dish they like the look of best. Open 6 p.m. to 9:30 p.m.
Izumi (Deck 12); a la carte: This Japanese restaurant catches the eye with bright murals of Japanese carp and color-pop cushions on the seating. The menu is split into starters, salads, carpaccio, soups and noodles, nigiri/sashimi, signature rolls, hot rock/ishiyaki and desserts. Prices range from $3 for miso soup and $10 for five pieces of sashimi, to $19 for a mixed seafood hot rock platter. The wine list, meanwhile, features seven different sake options and a range of Asian beers. Open for lunch, noon to 2 p.m., and for dinner, 6 p.m. to 9:30 p.m.